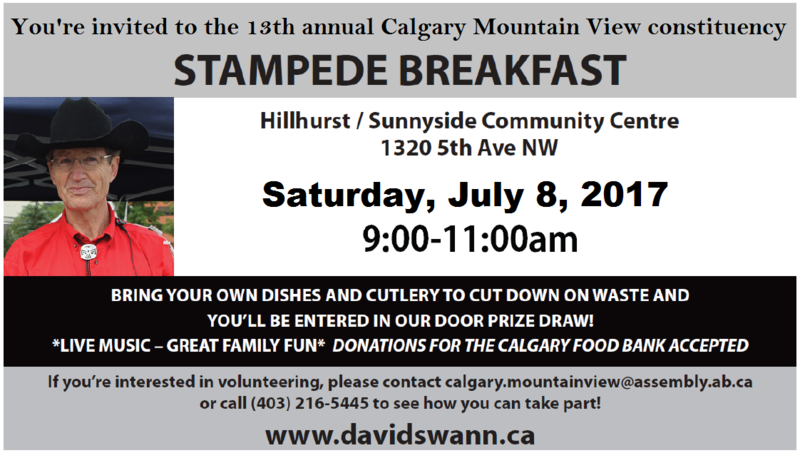 Grab your family and friends and join Dr. David Swann as he celebrates this 13th annual constituency Stampede Breakfast, Saturday, July 8, 9:00 to 11:00am at the Hillhurst-Sunnyside Community Association (1320 5 Ave NW). Bring your own dishes and cutlery to help us cut down on waste – washing stations are available – and receive a ticket for our door prize draws. This event is made possible with the help of more than 50 volunteers. If you’re interested in volunteering, we could use your help. Please email or call to sign up.